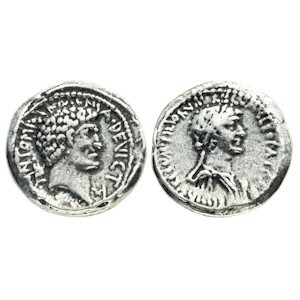 Obverse: Bare head of Mark Antony (Marcus Antonius) right, Armenian tiara behind. Text around ANTONI ARMENIA DEVICTA. Reverse: Diademed and draped bust of Cleopatra right, stem of prow before. Text around CLEOPATRAE REGINAE REGVM FILIORVM REGVM. History: This denarius coin commemorates the conquest by Mark Antony over the Armenians in 34 BC. The Armenian crown behind Antony represents his victorious Roman army, the prow beneath Cleopatra (which appears on no other Roman coin of hers) stands for the mighty Egyptian fleet.